Russia’s central bank opened its first overseas office in Beijing last month, coming one step closer to replacing the U.S. dollar as the world’s reserve currency. “The opening of a Beijing representative office by the Central Bank of Russia was a “very timely” move to aid specific cooperation, including bond issuance, anti-money laundering and anti-terrorism measures between China and Russia,” Dmitry Skobelkin, deputy governor of the Central Bank of Russia said. Financial regulators from both countries agreed last May to issue home-currency-denominated bonds in each other’s respective markets, a move that is seen as the beginning of the dethroning of the U.S. dollar, as both countries have stated they would implement a replacement for years. China opened up its gold market in 2016, an entirely separate system than the COMEX gold futures market in New York and the Over-the-Counter (OTC) trades cleared through the London Bullion Market. China and Russia have both been working to undermine the West and the U.S. dollar since China called for a new world reserve currency in 2009. A Wikileaks cable titled “China increases its gold reserves in order to kill two birds with one stone” shows that China was already shifting some of its massive foreign holdings into gold and away from the U.S. dollar in 2009. China again began stockpiling gold in 2013, when they bought JPMorgan’s building that previously housed its gold. The IMF and United Nations have even expressed agreement that it’s time to replace the U.S. dollar as the world reserve currency with what’s known as SDRs or special drawing rights. Then the Asian Infrastructure Investment Bank (AIIB) was planned between 2010-2012, and was fully operational by 2016. “China has been pushing for the SDR to become more widely used for some time, as a way to challenge the dominance of the dollar without pushing the renminbi as a direct competitor,” Julian Evans-Pritchard, a China economist at Capital Economics in Singapore, told Reuters. 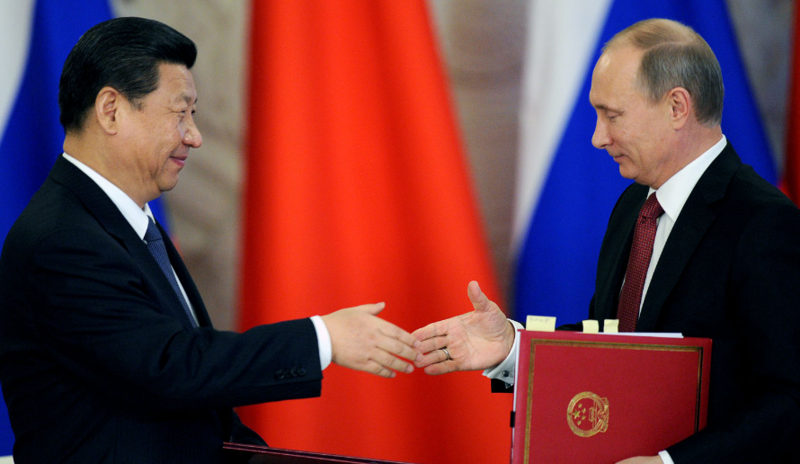 In 2014, Russian and Chinese central banks agreed on a draft currency swap agreement, which allowed them to increase trade in domestic currencies and cut the dependence on the U.S. dollar in bilateral payments made between the two countries. That same year, China’s Foreign Exchange Trade System extended the yuan’s swaps trading to 11 currencies on the interbank foreign-exchange market, Bloomberg reported. Russia and China furthered the dollar’s divide in 2015, by setting up an alternative to the EU-based global currency messaging and interchange service or SWIFT called CIPS or (China International Payment System.) China then approved the usage of the Russian ruble over the U.S. dollar for its border city Suifenhe City, Heilongjiang Province in a pilot program. Later the same year, the two countries opened up an e-commerce platform called incubator in that same province. Following years of work, on October 1st, 2016, the Yuan joined the IMF’s SDR currency basket. The IMF did an analysis and concluded that financial instruments denominated in SDR would lower volatility and risk compared to holding assets in individual currencies, as well as save costs. “M-SDRs could, therefore, be attractive to investors and issuers by offering a prepackaged diversification option,” the IMF wrote. For years now, Russia and China have begun buying gold in massive amounts and dumping U.S. Treasury bonds at an accelerating rate. Finally there is the BRICS alliance formed of Brazil, Russia, India, China and South Africa – to bypass and overtake the U.S. dollar as the world’s reserve currency. The current geopolitical tensions between the U.S. deep state and Russia make a lot more sense when you understand Putin is making moves against the globalist golden goose – the U.S. dollar.